Marketing for the new 9-5, shown, will include applications for Apple's iPhone and iPad. STOCKHOLM (Bloomberg) -- Saab Automobile AB will return to marketing this weekend with a blitz for the 9-5 model and may eliminate one-tenth of its dealers to reduce costs. “There's a huge wave of media and communication” that will start in Sweden when the 9-5 goes on sale June 19, Adrian Hallmark, executive director of sales, said. Saab will spend more than $150 million on marketing in the second half of 2010 after spending “nothing” on promotions since the sale by GM, he said. 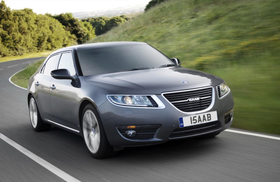 The new 9-5 is important to Saab's aim to become profitable by 2012. The Swedish carmaker will release the 9-5 in Belgium next week, the Netherlands the following week, and then other markets. U.S. dealers will start selling the car in early August, Hallmark said from the company's North American headquarters outside Detroit. The spending on promotion comes as Saab plans to reduce the number of dealers by between 50 and 100, from about 1,000, by the end of 2011, Hallmark said. The move will reduce expenses such as manager visits to dealers, shipping, training and support, he said. “If we have 10 percent less dealers and the same volume, those dealers make more money and we have less cost,” the sales chief said. Since General Motors Co. to Spyker Cars NV four months ago, Saab has focused on restarting production and severing most ties with GM. “We took the decision to conserve the marketing resources and wait until we got close to the 9-5 launch, and then go crazy,” Hallmark said. The marketing will feature “all media platforms” and include applications for Apple Inc.'s iPhone and iPad, Hallmark said. Saab dealers will arrange “hundreds of test drives” for potential customers in each market. “It's coming in waves, market by market, as the cars are imminent and start to get launched,” said Hallmark, who joined the Swedish company in March after a stint at Volkswagen AG, where he was executive director for Asia. Some of the advertising will tell the story of the company, which GM was close to shutting before selling it to Spyker, a Dutch supercar maker. Saab sales, which peaked at 133,000 cars in 2006, plummeted in 2009 to fewer than 40,000. Rather than eliminate dealers directly, Saab will work with some of them on teaming up or buying out each other, Hallmark said in a June 15 interview.